With several of her sister ships, CSL’s Stadacona ploughed her way through thick ice fields Thursday and headed for the lakehead. The Georgian Bay cleared Port McNicoll harbour at 5:00 PM Wednesday. 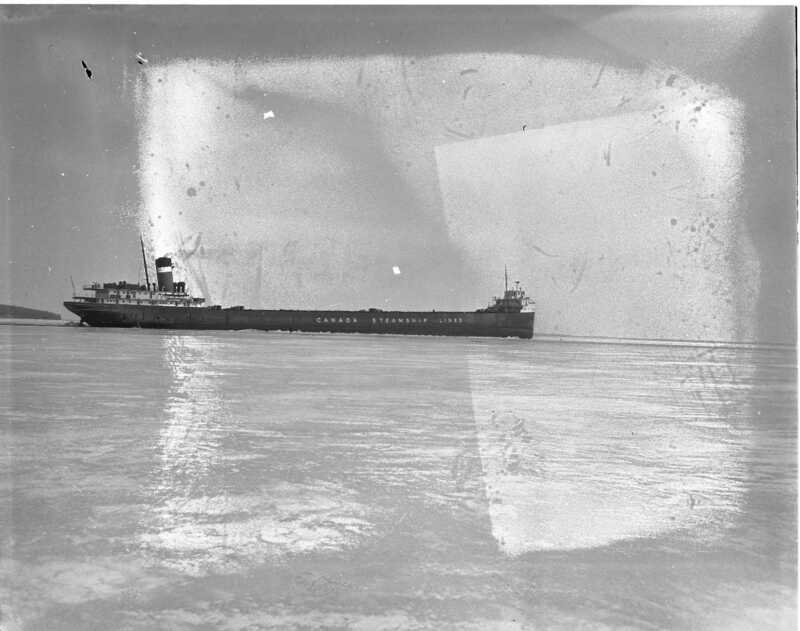 One ship is already reported Midland bound with grain for the empty elevators. 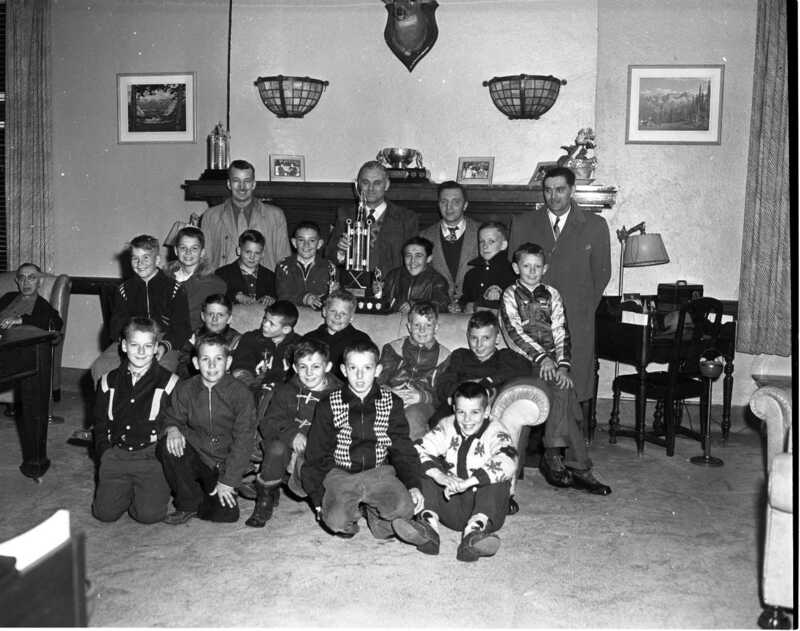 Midland’s only championship winning hockey team this season is seen in the lobby of the Georgian Hotel having just returned from Parry Sound Saturday night. They won the junior OHA section of the provincial Little Hockey League finals. Front row, Bill Argue, Doug Scott, Cecil Merkley, Jim Cleaver, Mike Dubeau; seated on chesterfield, Barry McIlvarey, Willard Perrault, Jim Dubeau, John Swan captain, Dennis Abbott, Wayne Holden, Chester Graham; standing, Jerry Beteau, Morley Bath, Paul Devillers, Herbie Wright and Doug Faint. Men at rear, Rev. Len Self, Jack Doughty, Clare Holden and Jack Gouett. Joanne Cruise, dressed up as a lady bug for the Midland Figure Skating Club’s annual carnival sponsored by the Midland Lions Club. 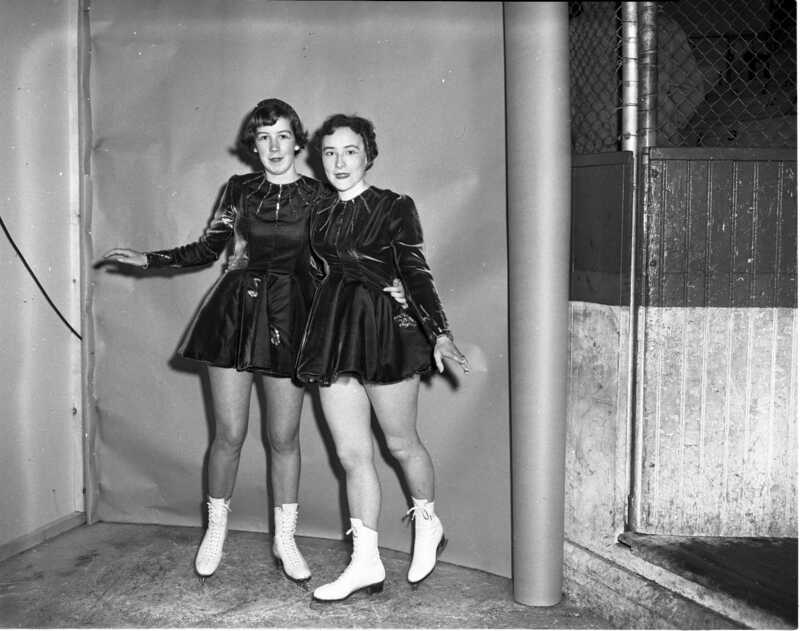 Two senior members of the Midland Figure Skating Club drew rounds of applause for their performance in the “Ice Follies of 1956” sponsored by the Midland Lions Club. Mary Ann Nicholson and Donna Kinnear. 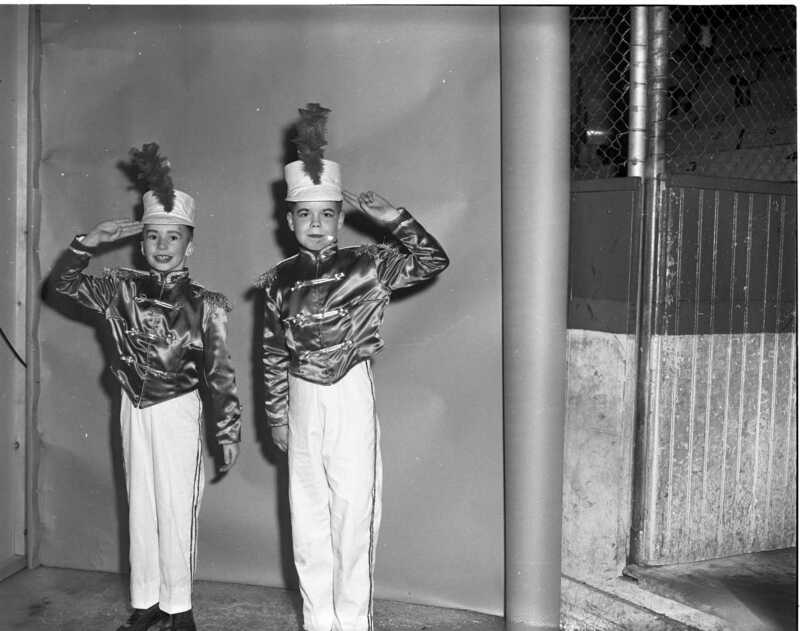 “Midland Ice Follies of 1956” tin soldiers give a snappy salute, Kennedy Self and David Walker. 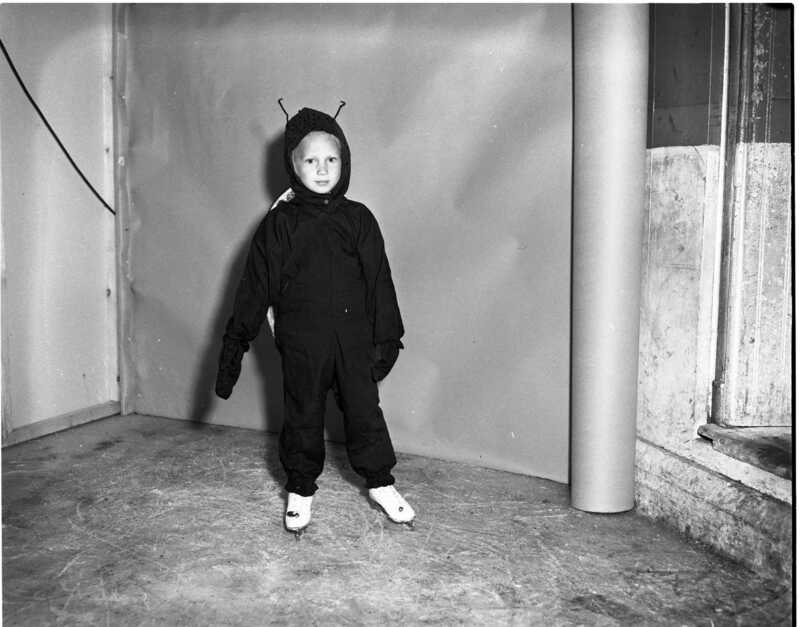 Many hours of hard work by parents goes into costumes for a skating carnival. 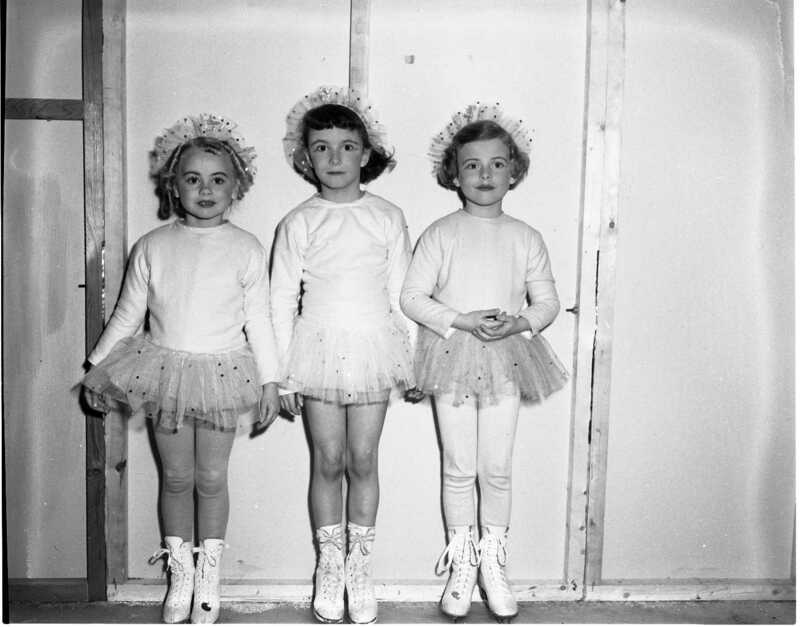 Midland Figure Skating Club participants Lorraine Jones, Jane Moss and Dianne Marcellus make convincing fairies. 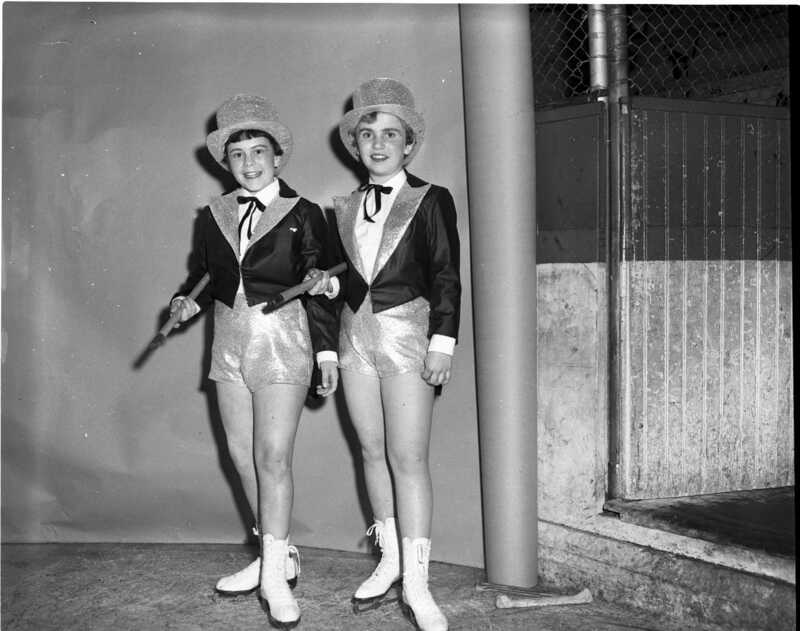 “Men About Town” seen at the Midland Figure Skating Club’s “Ice Follies for 1956” Friday and Saturday night are Linda Stewart and Judy Hack. 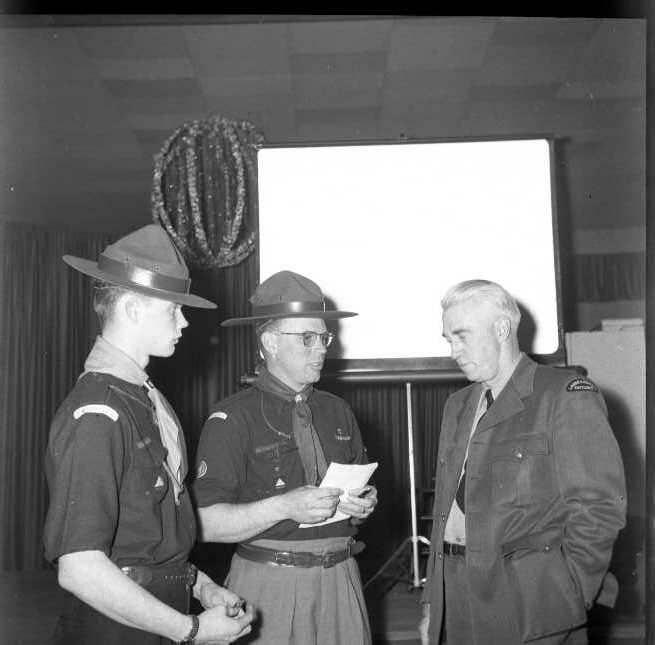 Scout leaders John Reynolds and Jack O’Hara of Penetang chat with conservation expert Stan Hudson of the Ontario Department of Lands and Forests after a conservation rally at the Parkside Inn last week. Mr. Hudson was the chief speaker. 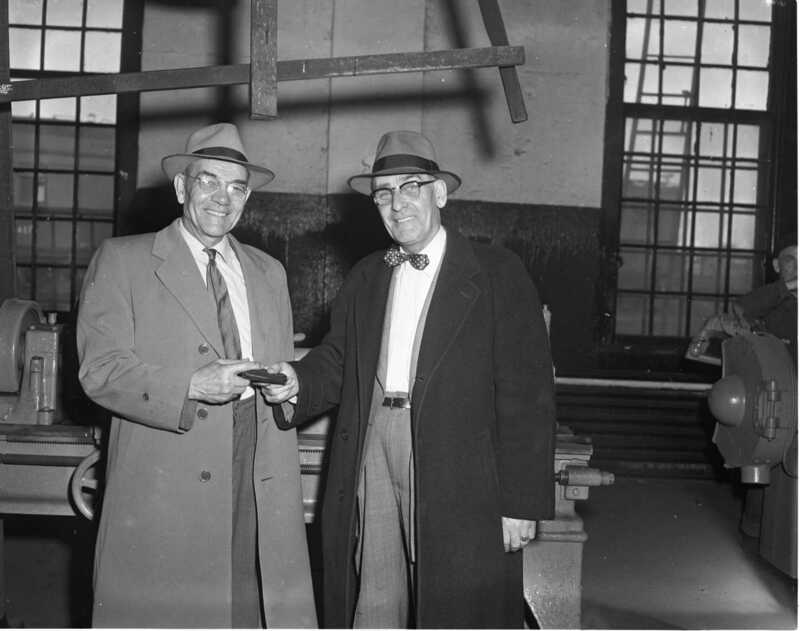 Theophile Fortier (left) had been working on the CPR railway for 44 years when this photo was taken inside the locomotive shop in Port McNicoll Friday afternoon. He is receiving a wallet, with cash, from Jack R. Lloyd division master mechanic on the occasion of his retirement. Mr. Fortier was raised on a farm on Conc. 19, Tiny Twp. and has worked for the railway since March 17, 1916. After 25 years as a Great Lakes captain Charles H. Cole had never earned a “topper” for opening the season in any port until this year. First into Sault Ste. Marie, Port Arthur and now Port McNicoll. 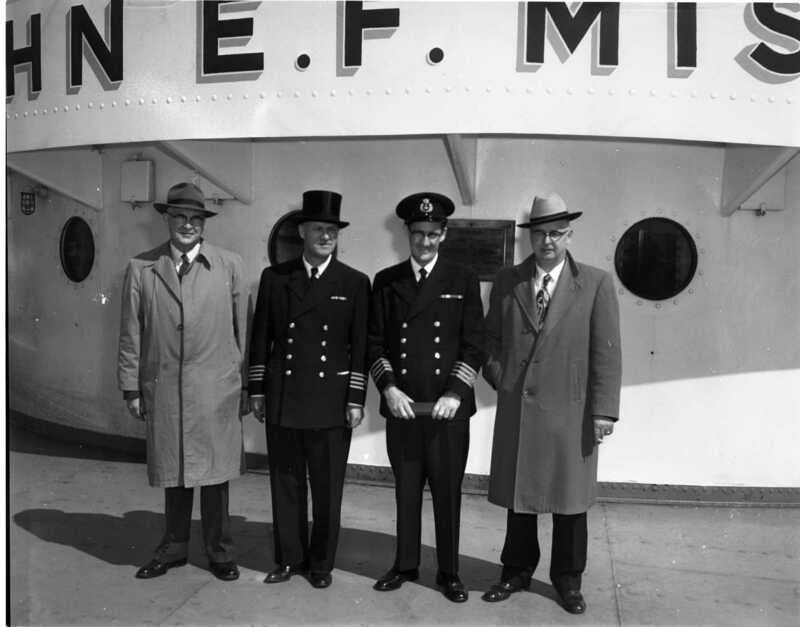 The master of the John E. F. Misener of the Colonial Steamship Ltd. shakes hands with Reeve Albert Calvert, while Chief Engineer J. H. McCleverty of Wales Ont. and councillor Jack Fisher look on. The Misener delivered 600,000 bushels of wheat to the almost empty elevator. Elmvale Bantam team were runner-ups in the Ontario Minor Hockey Association finals, both the first place Juvenile team and the Bantams will be given jackets at a banquet to be held in the community hall April 25th. 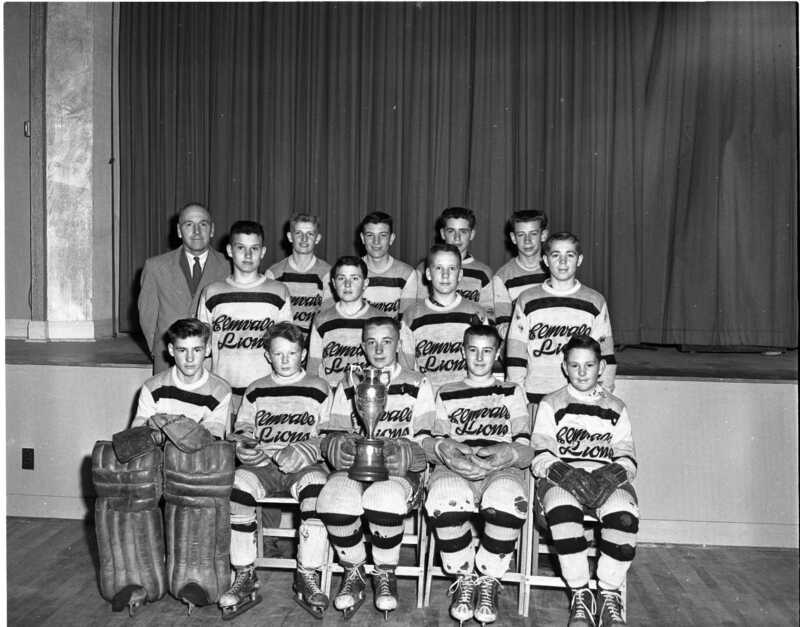 Team members front row; Raeburn Lawson, Andy Copeland, Bill Hogg the captain holding the Harold Dunk Trophy, Elvin Frankcom, Earl Spring; middle row, Russell Ritchie, Nelson Jordan, Ross Heacock, Bill Large; back row, C. M. French manager, Ed Bumstead, Sky Flotron, Bob Greenlaw and Larry Simpson. Absent, Tory Stevens. It’s a long way to Peterborough where members of the Midland Hi-Y Club attended a convention of clubs in the canoe city. 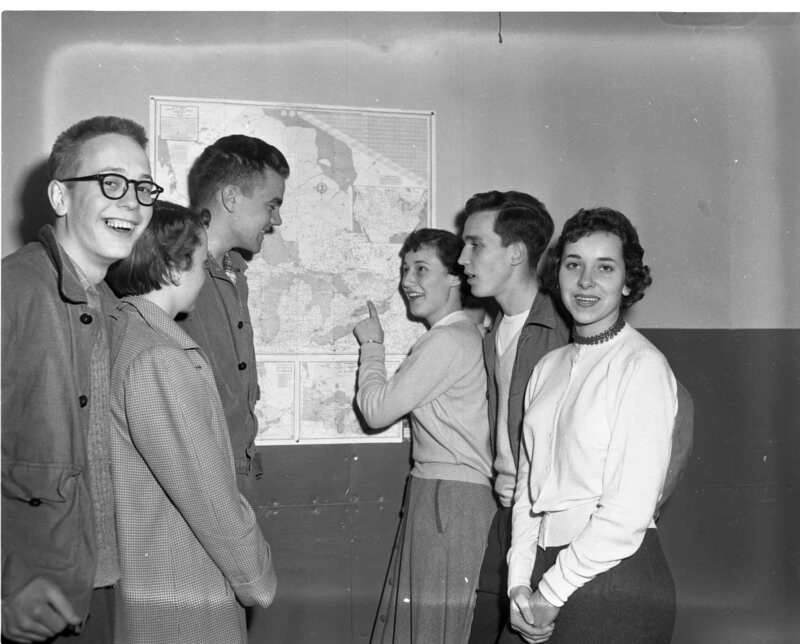 Bob McIntyre, Sandra Kettle, Bob Thompson, Helen Smith, Bev Day and Jane Bell. Bob Megaw and Shirley Perrin also attended. 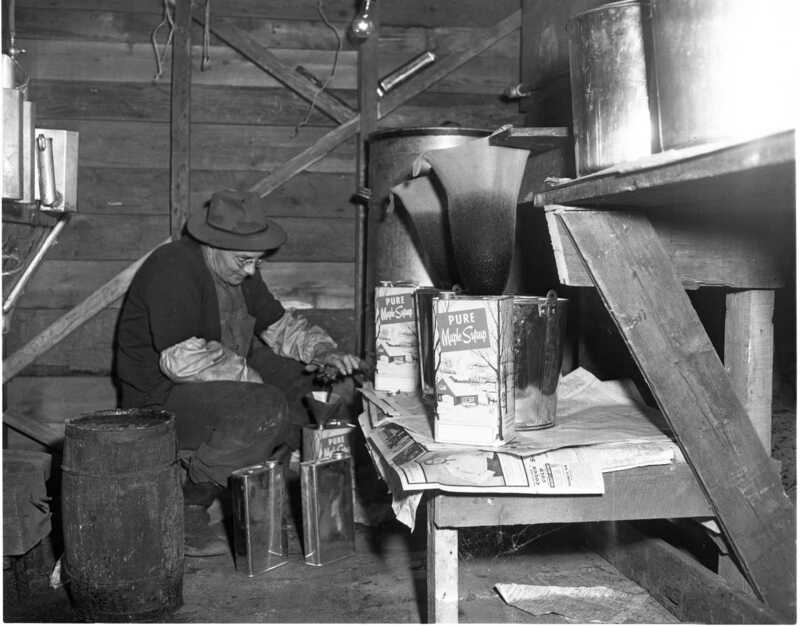 George Ingram stokes his evaporator and fills his maple syrup tins in his sugar shack at the end of Hugel Avenue as he has for thirty years. 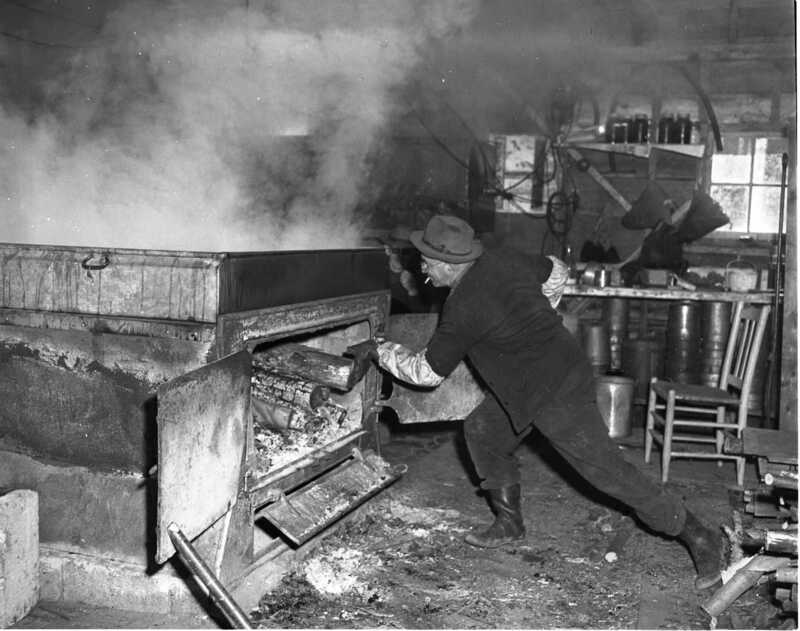 His sugar bush is soon to become the site of MPDHS. Syrup – Oui, Maple – Non, Canned Cane. One gallon cans of coloured cane sugar labelled in French are being sold as maple syrup locally, better to buy from local sugar bushes. Midland PUC and Local 1932 of the International Brotherhood of Electrical Workers signed their first agreement Friday afternoon. Signing for the workers was Morland Mount, Lloyd Alsopp and Elgin West. Midland Housing Authority is having trouble with wet basements in the new low rental housing development on Donalda Street. $200,000 subdivision for west end of Midland, builder to start Monday. Russell J. Peever, general contractor from Weston and local real-estate agent V. B. Strickland plan to build seventeen three bedroom brick homes in the Ingram subdivision opposite the new high school. Two versions, one at $11,200 (38 x 26) and a larger home for $11,700, (41 x 25). 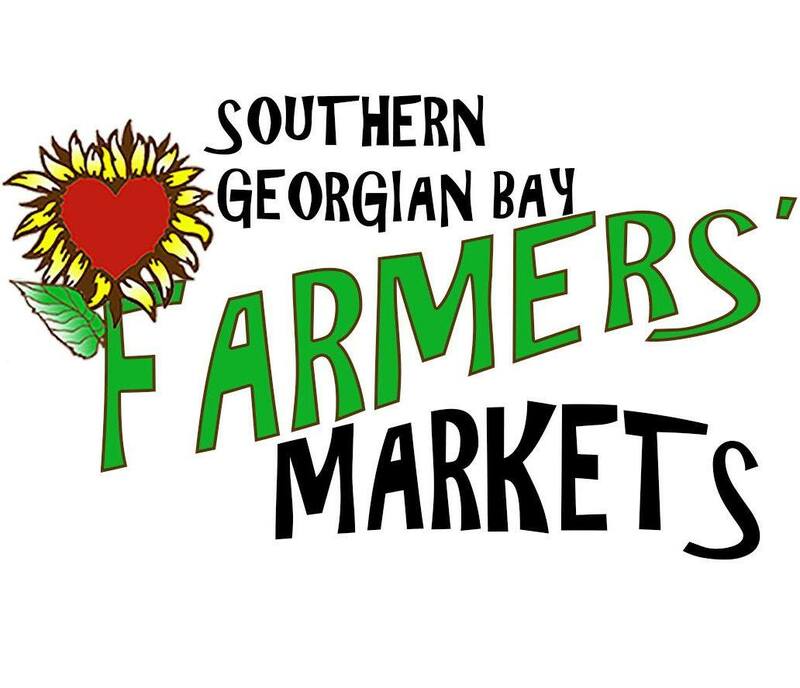 Waverly youth, Warren K. French wins $800.00 bursary, he will pursue his post graduate studies in organic chemistry. Didace Grise announces the construction of 24 more suites at the Delawana Inn this year bringing the total capacity to 250 guests. A list of all the citizens, organizations and businesses that contributed to the new hospital building fund in 1956 was printed in the April 13th paper along with the amount donated.